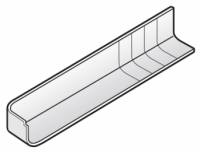 454mm White FloPlast Capping Fascia Board box end section - Double Ended - 1.25m length. This section of board is primarily used to make box ends. 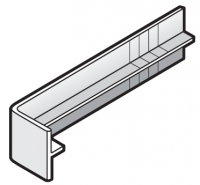 Please see our installation and technical information page for details of how to construct 'box end details'. (This products is also avaliable in FloPlast Woodgrain effects of Rosewood, Black Ash and Golden Oak. 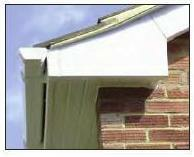 Please see our fascia and soffit sections for these colours). 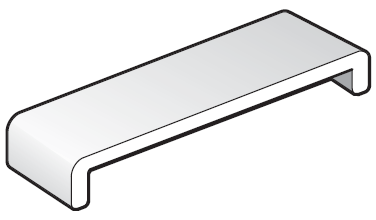 These FloPlast plastic fascia boards are 9mm thick with 2 x 42mm legs. All sizes are External measurements. These fascia boards are designed to be fitted over existing fascias/backing boards. For fitting recommendations/technical specifications for these FloPlast plastic fascia products please see our Installation and Technical Information page.